'We Did It Together,' Says Tunisian Co-Winner Of 2015 Nobel Peace Prize : The Two-Way The National Dialogue Quartet stepped in during the violent summer of 2013, when Tunisia was sliding toward a civil war in the wake of its 2011 Jasmine Revolution. Tunisia's National Dialogue Quartet, represented here at a news conference in 2013, won the Nobel Peace Prize on Friday for the group's contribution to building democracy after the Jasmine Revolution in 2011. Talking by phone with a Nobel representative today, Bouchamaoui was asked if the group has a leader; she replied, "No, it's a collaboration. We did it together, the four of us." The Nobel committee echoed that sentiment, saying there is only one laureate, and that this year's peace prize is not being split four ways. Many people are likely surprised by the Quartet's win: Before Friday's announcement, oddsmakers such as Britain's Paddy Power and Ladbroke's had favored German Chancellor Angela Merkel to win, for her country's accommodation of refugees and its role in the peace deal between Russia and Ukraine. Other favorites included Pope Francis, Eritrean priest Mussie Zerai and Dr. Denis Mukwege of the Democratic Republic of Congo. In Tunisia, the Quartet stepped in at a time when the country was sliding toward civil war in the wake of its 2011 Jasmine Revolution. With representatives from a wide range of Tunisian society, the Quartet calmed a fledgling nation that was being torn apart by violence — and by distrust between Islamist and secular leaders. 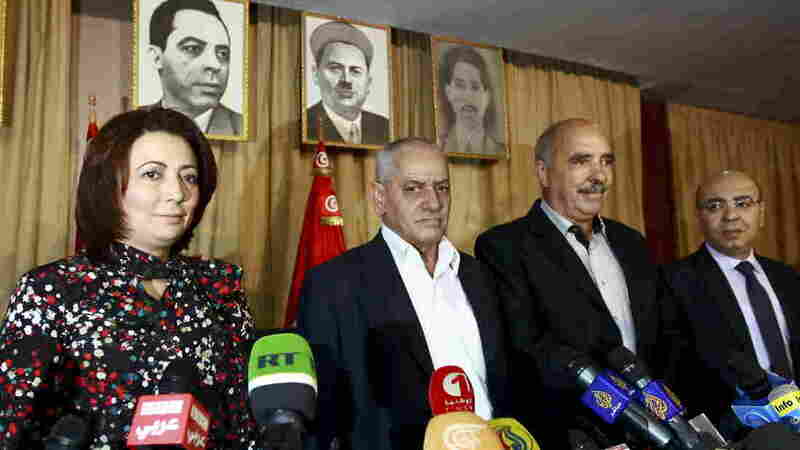 "The Quartet, made up of the General Labor Union; the Tunisian Confederation of Industry, Trade and Handicrafts; the Tunisian Human Rights League; and the Tunisian Order of Lawyers, was formed in the summer of 2013 to act as mediator between the warring parties." "The committee held Tunisia up as an example of a peaceful transition to democracy in a region mired in violence." The Quartet was chosen from a list of 273 candidates, with the committee praising the group's use of its moral authority to bring about change. The Quartet was "instrumental," the Nobel Prize committee said, in establishing a constitutional government "guaranteeing fundamental rights for the entire population, irrespective of gender, political conviction or religious belief." In her brief interview Friday morning, Bouchamaoui also said that the group knows its job isn't over. "We will continue our work," she said. "We are here to help our country. We are here to boost our investments."